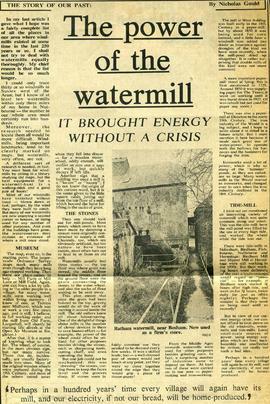 "The power of the water mill"
Cutting from 'West Sussex Gazette' mentioning the use of West Ashling Mill in the production of paper in about 1830. The piece is accompanied by a sketch by V. H. Slaymaker. Cutting from 'Daily Telegraph and Morning Post' of a submission by D. J. Asborne describing the story of how the Portal family escaped from France and settled down in England at Bere Mill. "Society's plan to save windmills"
Cutting from 'The Guardian' giving a brief history of New Mill near the Fulwell House. The article also mentions that the mill was converted into a paper mill in 1840, ans was destroyed by a fire in 1878. Cutting from 'Bucks Free Press' about fears of layoffs during strikes in car industry. Copy of photograph from Suffolk Preservation Society made by P. Dolman, showing Bramford Old Paper Mill in Bramford in Suffolk. 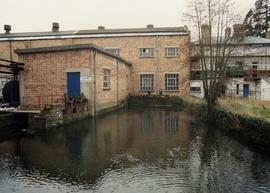 Photograph of the front of Bramford Old Paper Mill in Bramford, Suffolk, NGR 126482.